Noting that the college application process is stressful enough without the whole world watching, the Brown Daily Herald apologized this week on behalf of students who posted images of the first daughter's recent campus tour at Brown University, creating a social media frenzy.
" 'Brown University had no chill when Malia Obama came to visit,' " the editorial reads, quoting a report at the Daily Dot. 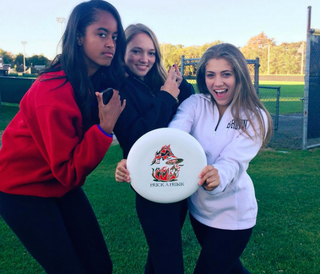 The incident occurred last week after the Daily Caller, a conservative news outlet, kicked off the media frenzy after obtaining a Snapchat photo showing 17-year-old Malia standing in front of cups arranged for a game of beer pong. She is not seen playing the game or drinking alcohol in the photo. While the editorial notes that students likely meant no harm, the board encouraged students to think twice about their social media posts because they have the potential to circulate beyond friends and followers. "The motivation to take these pictures was obvious: being at a party with the president’s daughter was an exciting, unexpected moment that many of us wanted to share with our friends," the editorial reads. "We often do not think about our tweets and Snapchats reaching anyone besides our friends and followers, and certainly not news outlets with wide circulation like Buzzfeed. Many Brown students were surprised and embarrassed to see themselves cited in the articles, as other Brown students posted them on Facebook with disappointed captions that criticized their peers for not simply leaving the 17-year-old alone on her college visit." The editorial concludes that "Malia did not choose to grow up in the White House, and it is unfair that everything she does at just 17 years old is subject to such harsh scrutiny. While the chances of her selecting Brown have probably decreased since the publication of those articles, if she does ever come back to Brown, hopefully next time we will 'have more chill.'" Read more at the Brown Daily Herald.